The Dryslide Bushings trademark identifies a whole range of self-lubricated dry sliding bushings and bearings. TH Series bushings have a composite structure consisting of a carbon steel backing, an intermediate layer of sintered bronze and a PTFE based sliding lining. The THX Series bushings have a composite structure consisting of a carbon steel backing onto which a porous layer of bronze is sintered and then impregnated with a co-acetal plastic. TH Series bushings have a composite structure consisting of a carbon steel backing, an intermediate layer of sintered bronze and a PTFE based sliding lining. Available in inch and metric sizes. The THX Series bushings have a composite structure consisting of a carbon steel backing onto which a porous layer of bronze is sintered and then impregnated with a co-acetal plastic. The polymeric surface has indentations in which the lubricating grease lies and protects the mating surface. Available in inch sizes. 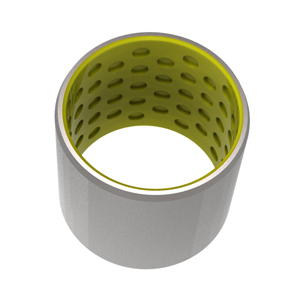 FTH Series bushing is a flanged style dryslide bushing. The FTH is a composite structure consisting of a carbon steel backing, an intermediate layer of sintered bronze and a PTFE based sliding lining. Available in inch and metric sizes. TS Flat strips series has a composite structure consisting of a carbon steel backing, an intermediate layer of sintered bronze and a PTFE based sliding lining. Available in inch and metric sizes. TW Series has a composite structure consisting of a carbon steel backing, an intermediate layer of sintered bronze and a PTFE based sliding lining. Available in inch and metric sizes.